Below you will find an example of a free graduation speech. This speech is geared towards the University/College level. Graduating from college is a great achievement and a profound time of change and possibility. Giving a speech at a college or university graduation is an honor and an important responsibility. leaving the audience with an inspiring message. 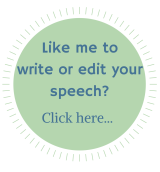 Use this free graduation speech as a guide and personalize it to create your own presentation to deliver at the graduation ceremony. President Wilson, Trustees, Faculty, family, friends and fellow graduates, I am honored to speak to you on this very important day. First, I'd like to thank the administration and faculty of State University for their hard work and dedication on our behalf. I think that college students often take their college experience for granted, as just the step between high school and the real world. As the first member of my family to graduate from college I do not take one bit of it for granted. So I thank every one of you who has made this university what it is and every one of you who has supported me and my fellow students along the way. We have gotten a great education here which makes it far more than a step between high school and the real world but rather a stepping stone to our futures. On a personal note, being the first college graduate from my family, I would like to honor my parents in the audience who encouraged me and supported me and without whom this would not have been possible. Thanks Mom and Dad! Fellow graduates, today we have finished something. Sometimes I think it is ironic that - in each endeavor in our academic lives - we learn and grow and achieve the highest level possible in that institution, and then we graduate. The next year we are thrown back to being the "low man on the totem pole" in our next school. Today, we are graduating seniors and this summer or fall many of us will be starting at those entry-level jobs that will be the beginning of our careers. Some of us will start graduate school, once again on the bottom rung of the ladder. But thanks to everything we have learned so far, I am confident that we will keep climbing, as if we are on an endless ladder to heights we've never achieved before. For that reason, I urge you to make sure that you are on the ladder on which you truly WANT to be. Remember that it is YOUR LIFE. Carl Jung said, "Your vision will become clear only when you can look into your own heart. Who looks outside, dreams; who looks inside, awakes." So, today I remind you all to look into your hearts and be awake before you embark upon a dream that is not your own. Up to this point in many of our lives, most things have been decided for us. From now on, it is up to us to choose. So be sure to make your choices when you are fully awake, choices that are informed by your heart and not by what others say or think or believe. Our contribution to the world will not be measured by the money we make or the accolades we receive, but rather by the way in which we share our unique gifts with the world. And the only place to find those gifts is to look within yourself. So go forth class of 2015 and make your unique contribution! Check out this page of quotes for graduation speeches. Using a quote in your presentation often helps to make your speech more memorable for your audience. A quote can also inspire you to add more impact to your speech!